How can I programmatically detect bullish and bearish RSI divergences? 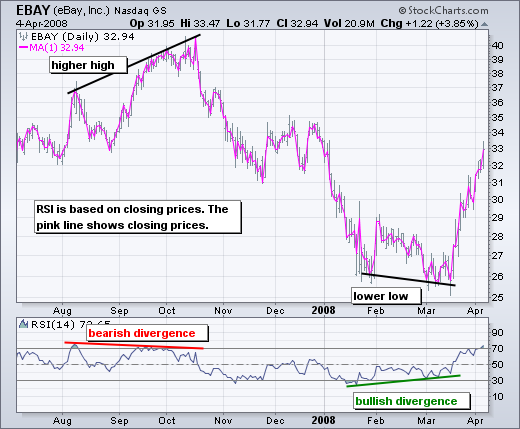 A bullish divergence occurs when the underlying security makes a lower low and RSI forms a higher low. RSI does not confirm the lower low and this shows strengthening momentum. A bearish divergence forms when the security records a higher high and RSI forms a lower high. RSI does not confirm the new high and this shows weakening momentum. I was searching for answers to the same question and came across your question. After some thought and research, here is the plan I have developed. I will be working in Python. Calculate relative maxima and minima with SciPy. Calculate RSI at those points using lib-ta. For each pair of lows and highs, compare the change in price with the difference in RSI. I'm completely new to technical analysis, so in case I have made any oversights, feedback would be greatly appreciated. I wanted to ask about your programming language and data format, but don't have enough reputation to comment. Not the answer you're looking for? Browse other questions tagged programming algorithmic-trading algorithm indicator or ask your own question.